The pin-tailed green pigeon (Treron apicauda) belongs to the family of doves and pigeons, the Columbidae. The pin-tailed green pigeon species is distributed in India, Nepal, Bhutan, Bangladesh, Myanmar, Thailand, Cambodia, Laos, Vietnam and China. These green pigeon species have pin-like elongated central tail feathers. These green pigeons are polytypic species. The pin-tailed green pigeon (Treron apicauda) is a medium-sized pigeon, measuring 30 to 35 cm in length and weighing 180 to 260 grams. The male pin-tailed green pigeon has olive colored forehead, crown and nape. The neck and mantle are grayish green. The chin, throat and ear coverts are bright yellowish green. The breast has orange wash. The female has grayish green breast. The back, rump and uppertail coverts are bright yellowish olive. The primaries are black. The uppertail is slaty gray with olive tinge at the base. The undertail coverts are rufous and the undertail is gray. The central tail feathers are elongated and pin-like. The cere and the base of the bill are bright blue. The tip of the bill is pale blue. The irises are red. The orbital ring and the lore are azure. The feet are crimson. The call of these pin-tailed green pigeon species is a soft "ku-koo" and higher pitched "huu" or "hoi" sound. The pin-tailed green pigeons are distributed in India, Nepal, Bhutan, Bangladesh, Myanmar, Thailand, Cambodia, Laos, Vietnam and China. 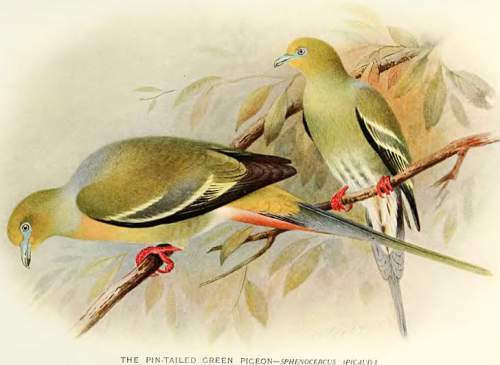 In India, these green pigeon species are distributed in the states of Uttarakhand, Sikkim, northern West Bengal, Assam, Meghalaya, Arunachal Pradesh, Nagaland, Manipur, Tripura and Mizoram. 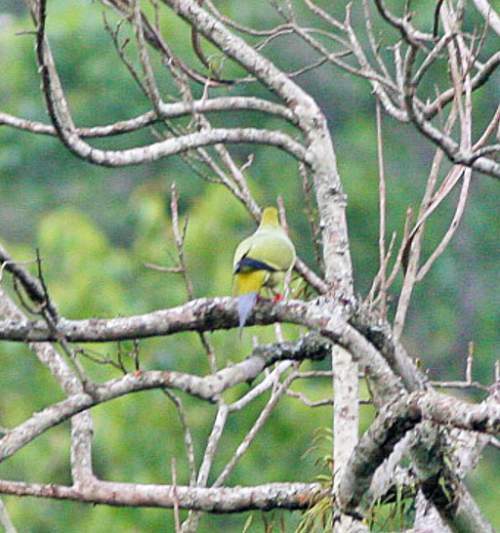 These pin-tailed green pigeon species have moderate forest dependence. They normally occur in altitudes from 0 to 1800 meters. The natural ecosystems and habitats of these pin-tailed green pigeon species include tropical and subtropical dry forests, foothill forests, sub-montane forests, evergreen rain forests and secondary forests. The diet of this pin-tailed green pigeon consists mainly of fruits. Wild fruits, drupes, berries and figs are their primary food. 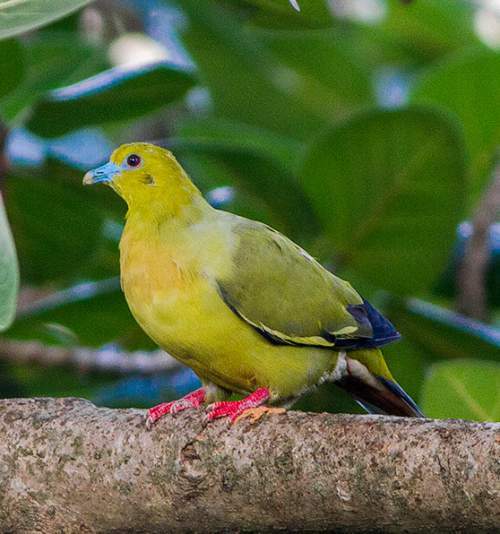 These green pigeon species feed in small flocks in the lower canopy of the forest. The breeding season of these pin-tailed green pigeons is mainly from April to June in Himalayan foothills. These species may breed all year round in Indochina. These species are monogamous. The nesting sites include bushes, bamboo clumps or leafy trees. Their nest is a flimsy platform of twigs and sticks placed 2-7 meters above the ground. The clutch contains two white eggs. Both the parents incubate the eggs and take care of the young. These pin-tailed green pigeon species are non-migratory resident birds. They disperse locally after breeding. The populations in higher altitudes descend to the lower levels during winter. The global population size of the pin-tailed green pigeon (Treron apicauda) has not been quantified. The overall population trend of the species is considered to be stable. In most of its range, this species is reported to be locally common to uncommon. The generation length is 4.2 years. Its distribution size is about 3,220,000 sq.km. Habitat alteration and destruction, ecosystem modifications, human intrusions and disturbance and trapping for pet-trade are the main threats that are endangering the survival of these pin-tailed green pigeon species. The pin-tailed green pigeon (Treron apicauda) does not approach the thresholds for being Vulnerable, either under the range size criterion, or under the population trend criterion or under the population size criterion. The CITES (Convention on International Trade in Endangered Species of Wild Fauna and Flora) status is ‘Not Evaluated’ for the pin-tailed green pigeon (Treron apicauda). The pin-tailed green pigeon (Treron apicauda) is closely related to the Sumatran green pigeon (Treron oxyurus), yellow-vented green pigeon (Treron seimundi) and wedge-tailed green pigeon or Kokla green pigeon (Treron sphenurus). The three recognized subspecies of the pin-tailed green pigeon (Treron apicauda) are: Treron apicauda apicauda Blyth, 1846, Treron apicauda laotinus (Delacour, 1926) and Treron apicauda lowei (Delacour & Jabouille, 1924). Current topic in Birds of India: Pin-tailed green pigeon - Treron apicauda.